Henry Purcell’s 7-part fantasy for viola de gamba ensemble is one of the most poignant compositions from the English baroque period. 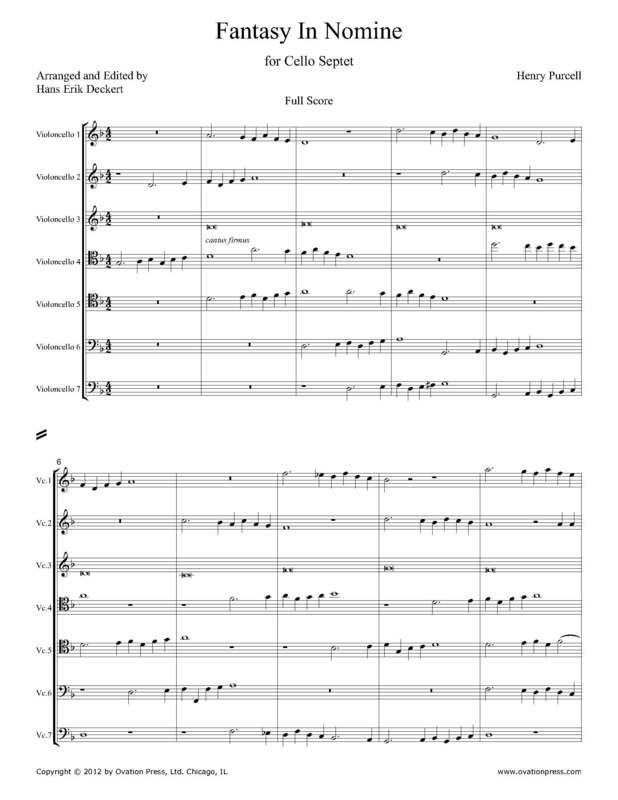 The last of the Fantasy pieces, nicknamed "In Nomine", is here in a version for cello septet. "In Nomine (Domini)" means "In the name of the Lord" and refers to the cantus firmus, which is the foundation of this work. In this arrangement it is played as long note values in the third cello, and would be even more effective if played by multiple cellists. This cantus firmus melody originated from the Gregorian chorale "Gloria tibi Trinitas". "In Nomine" compositions were very common in English music from that period. This close polyphonic writing in the other six voices often evokes sharp harmonic dissonances such as an A-flat and an A in measure 20 or B-flat and B in measure 41. The pitches in all the voices are kept true to the original scoring.